Now that you have covered the basics of creating an analysis and interpreting the results, it is time for some advanced topics that allow you to fine tune the analysis in accordance with your interpretation of the patient's information. - Polar rubrics and contra indications. 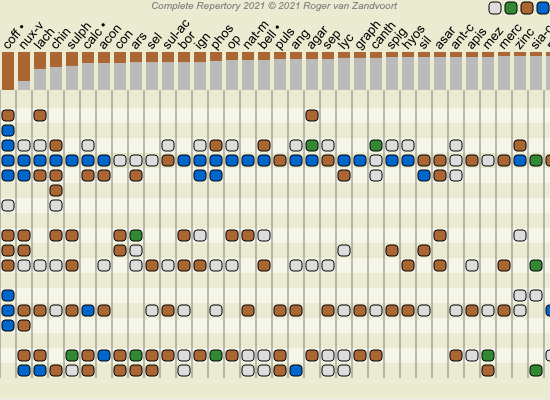 - Filter the results on remedy families. Many actions can be performed on multiple selected lines at once. To change the selection of a single line, hold the cmd key and click on the line. You can also change the selection of a single line by clicking at the left of the text. 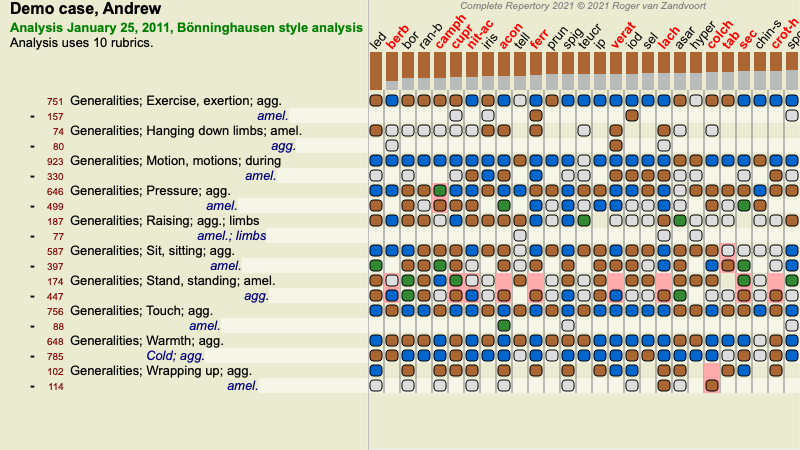 Every Symptom and every Rubric can be assigned a given Weight. Just like you assign a certain importance to a patient's symptoms, or just like a remedy in the repertory can occur with different grades, you can assign a certain importance to each of the Symptoms and Rubrics. By assigning a higher value, the Symptom or the Rubric is counted with more importance in the analysis result. And by assigning a weight of 0, the Symptom or Rubric is excluded from the analysis completely. To set the weight, first select a Symptom or Rubric by clicking on it with your mouse. - key 0 (Menu option Case / Weight / Ignore, toolbar button ). - key 1 (Menu option Case / Weight / Weight normal, toolbar button ). - key 2 (Menu option Case / Weight / Weight x2, toolbar button ). - key 3 (Menu option Case / Weight / Weight x3, toolbar button ). - key 4 (Menu option Case / Weight / Weight x4, toolbar button ). You see the toolbar buttons on the left. The toolbar buttons always show the actual weigth value of the selected Symptom or Rubric. The X before a Symptom or Rubric indicates a weight of 0, it is excluded from analysis. Balancing of Symptoms is an advanced analysis mechanism, compensating the use of many/few Rubrics in a Symptom. When balancing is switched on (which it normally is), you can place as many Rubrics under a Symptom as you want, without disturbing the analysis. In traditional analyses, you would have to carefully select rubrics in an analysis, because if you would use too many rubrics to express a certain symptom, the remedies matching that single symptom would start to dominate the analysis. 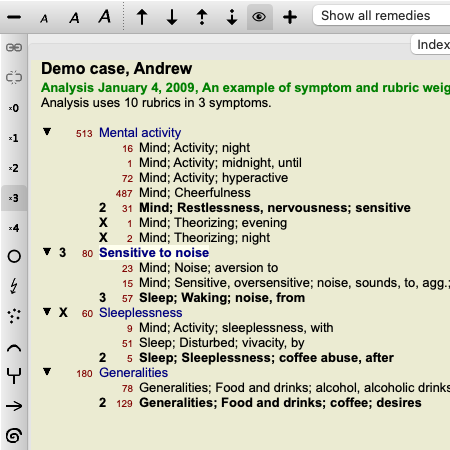 Likewise, if you would only use a single rubric, the remedies in that rubric would not sufficiently contribute to the overall analysis, compared rubrics used for the other symptoms. With Balancing of Symptoms switched on, every Symptom is counted with the Weight (see Using weights above) assigned to it, no matter whether you place a single Rubrics under it or, let's say, 10 Rubrics. Balancing symptom is switched on/off with the toolbar button , found on the right side of the window. 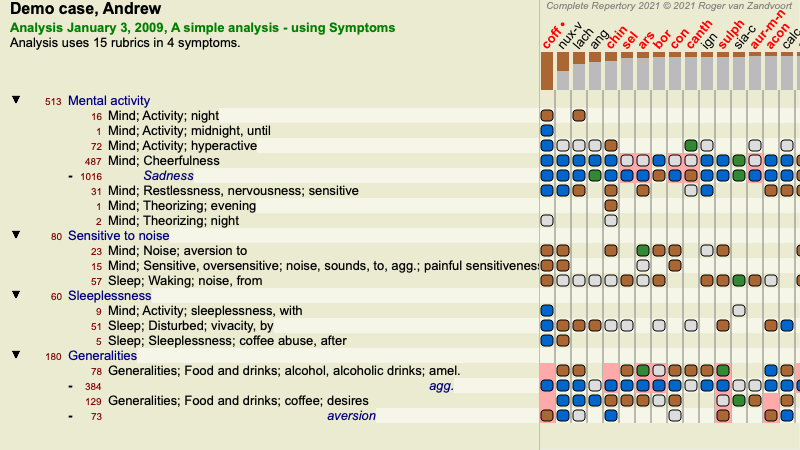 (Menu option Analysis / Balance symptoms, toolbar button ). Let's take a look at an example. 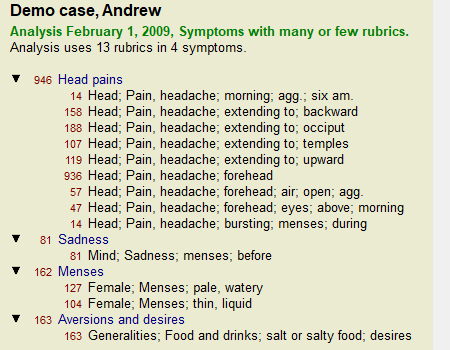 In the following analysis, many rubrics are used to express the head pains. If no Balancing is used, Glonoinum dominates the results, whereas with Balancing Natrum Muriaticum becomes more apparent. Note: Balancing Symptoms has no effect on the basic analysis Simple Counting. Polar rubrics are two rubrics which have an opposite meaning. It is possible to use these polar rubrics in the analysis by pressing toolbar button , found on the right side of the window. (Menu option Analysis / Polar rubrics, toolbar button ). 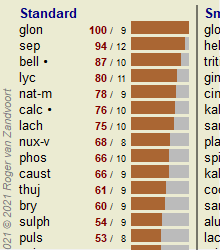 Now, under both rubric amel and desires, their polar rubrics are shown. The result of the analysis is also changed, because the values of remedies are now corrected with the values in the polar rubrics. Remedy coff is now colored red, because in this analysis it is contra indicated. A contra indication is a situation in which a remedy occurs in one rubric in a low grade (1, 2, or does not occur at all), but in the polar rubric in a high grade (3 or 4). Grouping of rubrics is done when you want two or more rubrics to count as if they were together a single rubric. - Crossing. Only remedies that occur in ALL rubrics are used. - Combining. Remedies from ANY of the rubics are used. Crossing of rubrics can be useful when there is no rubric in the repertory that exactly describes a patient's symptom, but only more generic rubrics. For example, the patient tells that during fever he has anxiety in bed in the morning. The repertory does not have a rubric Mind; anxiety; morning; bed, in; fever, during. But instead of this, there are two more generic rubrics Mind; anxiety; morning; bed, in and Mind; anxiety; fever heat; during. 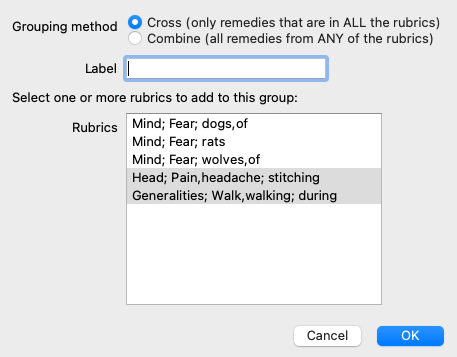 By crossing those two rubrics, a new grouped rubric is created containing only the remedies that occur in both rubrics. Combining rubrics can be useful when the patient has a symptom that is not found exactly, but can be found under more specific symptoms. For example a desire for pizza. Why is it that the patient likes pizza? Maybe it is the dough (farinaceous food), tomatoes, salami, anchovies, cheese, or olives. It can be useful to combine a number of such specific rubrics into a new rubric, without disturbing the analysis formulas by adding lots of specific rubrics that don't really matter in comparison to the patient's chief complaints. We want to Cross the two rubrics that together describe the head pain. 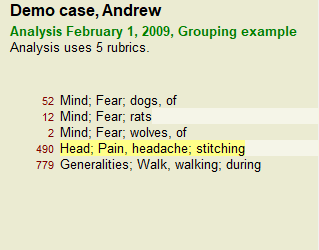 Select rubric Head; pain; stitching by clicking on it, then press the toolbar button . (Menu option Case / Grouping / Group with other rubrics..., toolbar button ). A dialog pops up, in which you can select the rubrics that can be linked with the selected rubric. 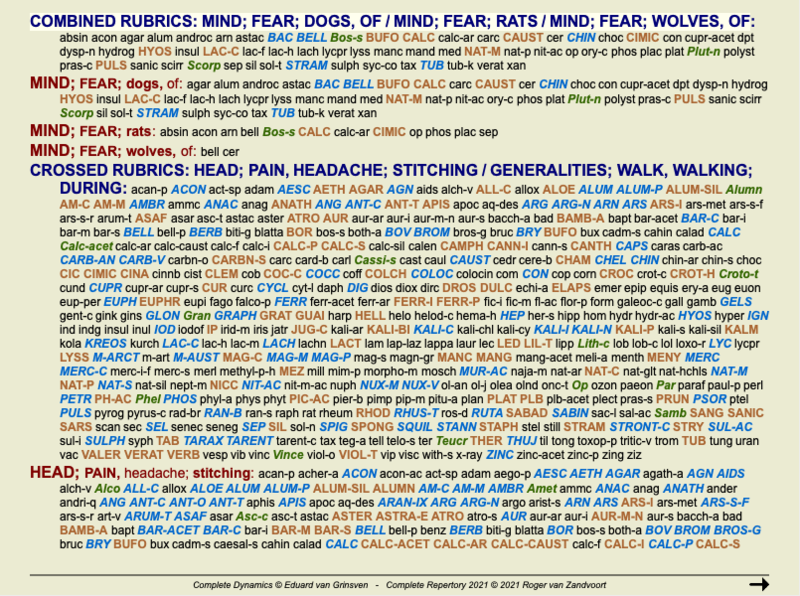 Select rubric Generalities; walk, walking; during and press the OK button. For the second group we will use another method. Select the three rubrics of Mind; fear and press once more. Now select option Combine, and press the OK button. To change a group, simple click on the group's main rubric and press . In the dialog, toggle rubrics on and off by clicking on them. You can also remove a rubric from a group by clicking on it and pressing . (Menu option Case / Grouping / Remove grouping, toolbar button ). 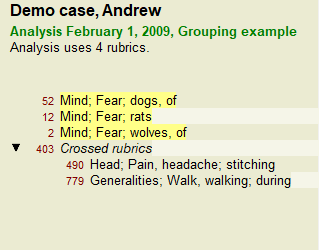 To remove a group completely, click on the group's main rubric and press . (Menu option Case / Grouping / Remove grouping, toolbar button ). There are two menu options that allow you to quickly create a group, without having to select rubrics in the dialog, as shown above. You can first select two or more rubrics, and then Combine them. (Menu option Case / Grouping / Combine selected rubrics). You can first select two or more rubrics, and then Cross them. (Menu option Case / Grouping / Cross selected rubrics). When crossing multiple rubrics, the group contains only those remedies that occur in all the rubrics in that group. The remedy grade will be the lowest grade of the remedy in all the rubrics. When combining multiple rubrics, the group contains the remedies that occur in any of the rubrics in the group. The remedy grade will be the highest grade found for the remedy in any rubric in the group. Sometimes it is convenient to get an overview of all rubrics in an analysis together with their remedies. 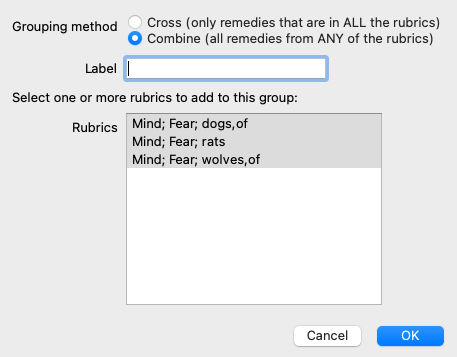 Also, in case of grouped rubrics, you might want to see which remedies occur in the resulting group. To get an overview of all rubrics, just choose Show rubric overview. 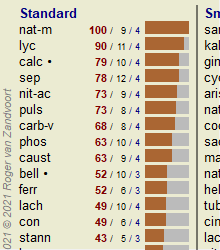 (Menu option Case / Show rubric overview, control-V). 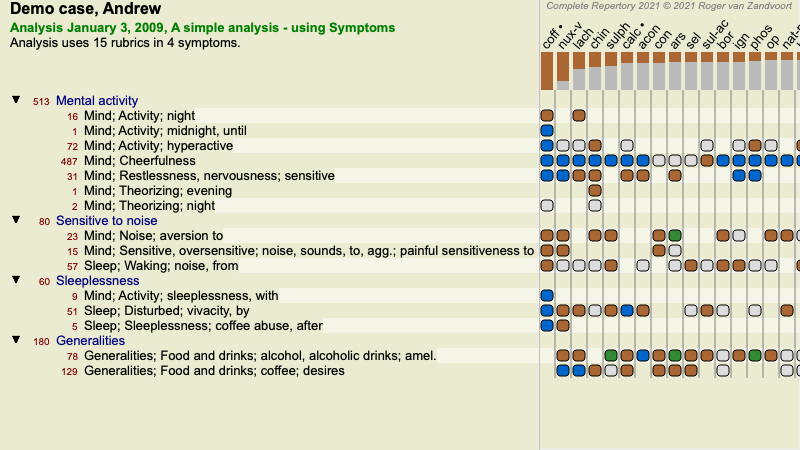 In the Table and Grid analysis graphs, remedies are shown according to their grades, in 4 different styles. In the calculation of the analysis formulas, a more refined value than just 1-2-3-4 is used for each remedy. It can be important to see how heavily each remedy is weighed in the analysis results. This is especially important in case you are applying your own analysis formulas. 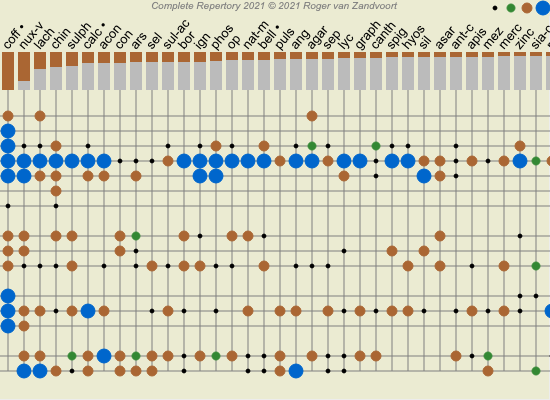 You can show the relative importance of each remedy by clicking . (Menu option Analysis / Show relative importance, toolbar button ). In the Table view, remedies are then shown as a square with a light to dark color. The darker the color, the more relative importance is given to the remedy in the analysis. Please compare the following two pictures of the same analysis. The first picture shows the remedies with grades 1 to 4, the second picture shows the remedies according to their relative importance for the analysis. 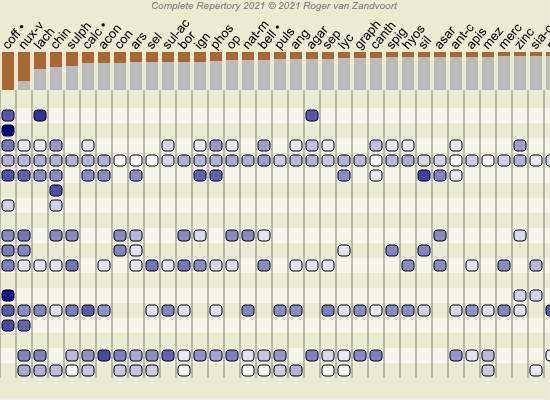 In the Grid view, remedies are normally shown in different colors and with different sizes. 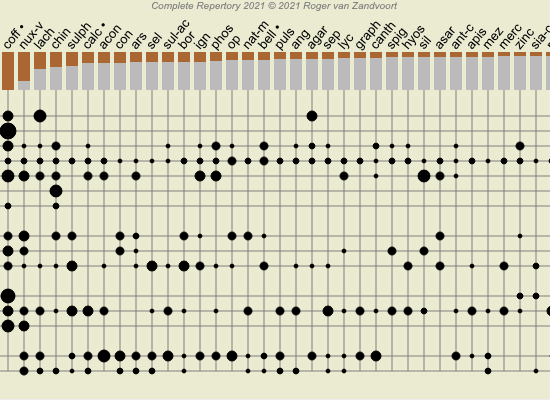 When showing the relative importances, all remedies are drawn with black dots with a variable size. The larger the dot, the more relative importance is given to the remedy in the analysis.